Sandal season is almost in full effect and I admit, I'm a little biased towards today's Shoeography Shoe of the Day. First, I'm totally in love with this footwear brand and second, as a Scorpio, how can I not be weak to the Aethon Ulyse Diana Sandals, which celebrates my zodiac animal sign, the Scorpion, and also the brand's signature logo which represents the seductive, strong, and a bit dangerous Scorpio woman. This striking Italian made sandal features a 100% Italian Leather and mesh upper, a hand woven gold scorpion embellishes the vamp with a tail that wraps around the ankle, a 24k hammered gold leaf insole, and a low stacked 1" wooden heel for the optimal mix of style and comfort. 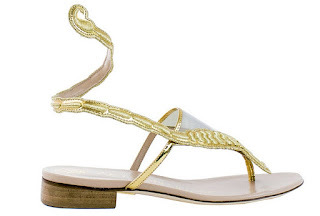 Treat yourself to this luxury sandal for $534.00 from www.aethonulyse.com.